The origins of PLAN 425 can be traced back to the early 1970s, when the School of Community and Regional Planning (SCARP) launched what was then its first and only undergraduate course. Catered towards an undergraduate audience of third and fourth year students across various disciplines at the University of British Columbia, PLAN 425 aimed to provide an introduction to the complex world of planning. In its inception, PLAN 425 was designated with the course title “History of Urban Planning”. 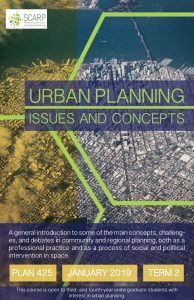 In the 1990s, PLAN 425 was renamed to its current course title “Urban Planning Issues and Concepts”. Over the span of its enduring record, many individuals contributed to the design and teaching of PLAN 425—they include past and present SCARP faculty (Profs. Brahm Wiesman, Alan Artibise, Tom Hutton, Michael Leaf) as well as PhD students (now alumni: Janice Barry, Ren Thomas, Victoria Barr, Sarah Church). At its heart, planning is an action-oriented and problem-oriented activity. As a profession, planners use well-defined tools such as zoning by-laws, citizen engagement, and land-use policies to manage a wide range of issues, including transportation, housing, real estate development, community-building, and the allocation of social services, which affect our everyday lives in communities, cities, and regions. As a general practice by ordinary citizens, planning operates in complex social and political environments that are shaped by local, regional, national, and transnational forces. This course aims to critically engage students with the multiple meanings, practices, and tools that shape the field of urban planning. reflection on knowledge produced from the investigative process. This course website features student learning outcomes achieved through an inquiry-based pedagogic strategy in which I experiment with the design of a course assignment called “Neighbourhood Portraits eZine”. For further details, please click here or see the menu tab above.